Why hire a VW Beetle? 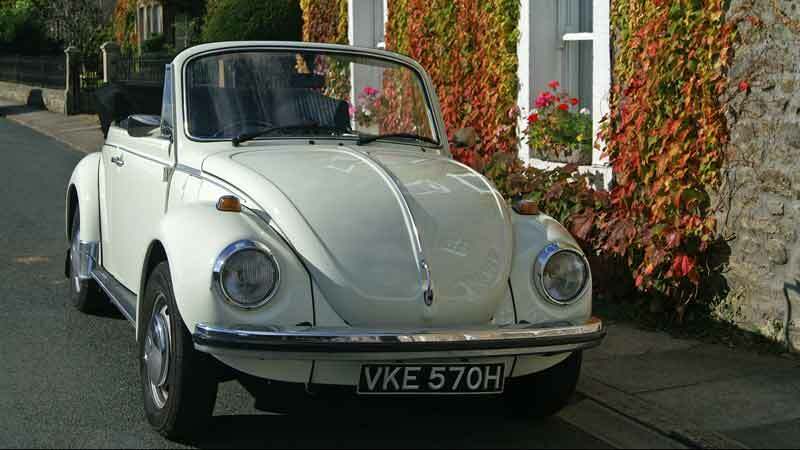 A VW Beetle hire gives you a chance to experience driving this fondly remembered classic car with a cult following, affectionately nicknamed the ‘Bug’. 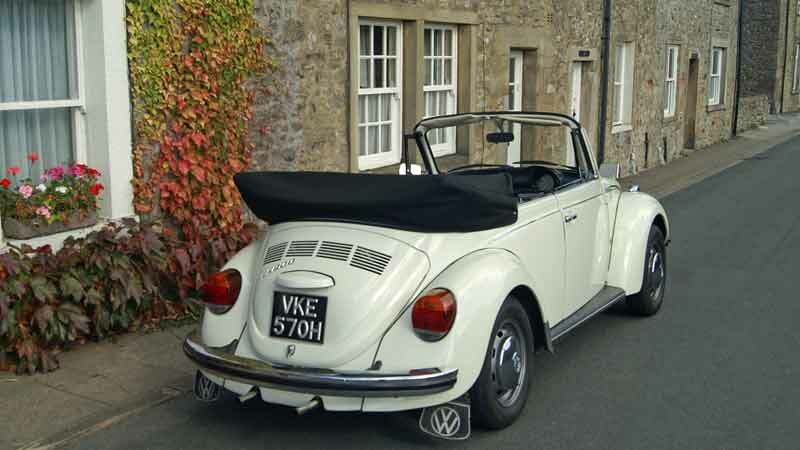 The Beetle hire car we have in Leeds is a convertible, making it ideal for open topped motoring in beautiful Yorkshire or Lancashire countryside. Whether you want to have a leisurely day or weekend out in a classic car, or to buy a gift for someone who is a great fan of the VW Beetle, this one fits the bill. It also makes a cute and unusual wedding car which will make you and your guests smile. 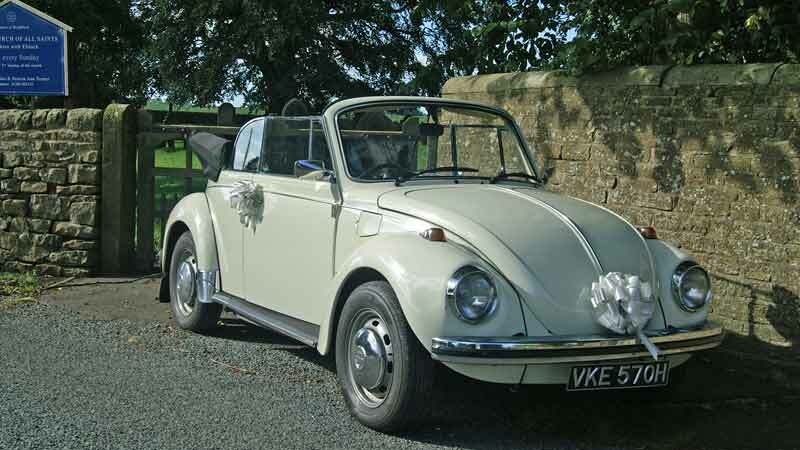 When hiring a self drive Beetle wedding car we know that collection can be difficult when you’ve so much to do on the day, so have a look at the wedding package. Originally built by Karmann in Germany, our 1970 VW Beetle Convertible has had a full body restoration in the last ten years and has covered only about 4,000 miles since. It is white with a black interior, and black hood. This Beetle hire car meets the original factory specification even down to the steel wheels. Although not fast in anyone’s book, a Karmann cabriolet is stylish, rugged and great fun to drive. 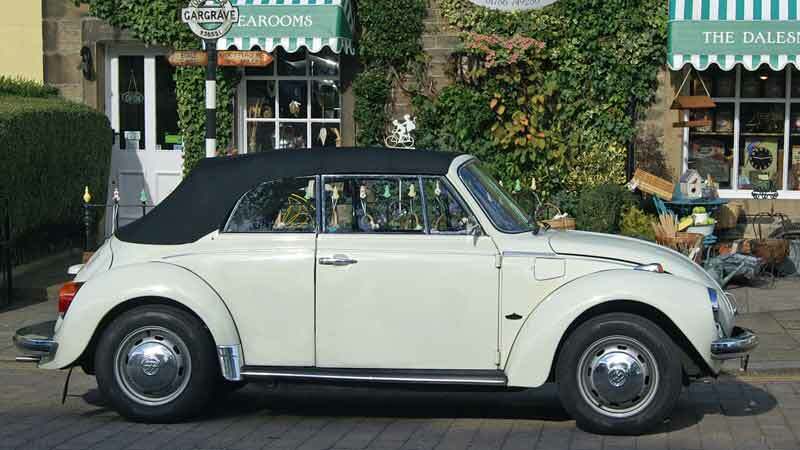 Karmann cabriolets were produced between 1950 and 1980 and what sets them aside from other soft-tops, Beetle-based or not, is the quality of the hood. Our Beetle hire car is the 1302 model with a 1600 engine, which, together with the 1303, is commonly called the ‘Super Beetle’, due to having had the most radical rework of the Beetle during its long life. MacPherson strut front suspension was adopted, which allowed more front boot space and improved handling. The struts also allowed front disc brakes to be fitted. Instantly recognisable, loved at first sight and probably the world’s most successful motor car, the VW Beetle was designed by Ferdinand Porsche. History reminds us that Adolf Hitler also played a part in bringing the ‘strength through joy’ project (as the Volkswagen was originally known) to fruition. 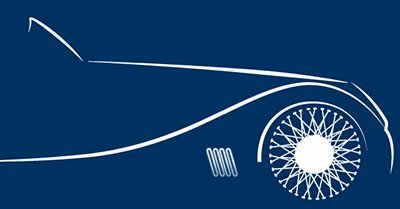 Hitler met with Porsche in 1933 and asked him to develop a car which was affordable for everyone, a Volks Wagen or “Peoples car”. However, some say that the dictator’s role is often overstated and that he actually hindered Porsche’s development of the Volkswagen. All pre-war Beetle deliveries were limited to Nazi party officials and nearly 340,000 German workers who had paid for the cars were denied them. Production was diverted instead to military vehicles. Aside from Hitler’s interference, the Allies repeatedly bombed the Wolfsburg factory (which had been diverted into the manufacture of flying bombs) damaging much of the machinery. After the war ended in 1945 Allied military personnel were sent to Germany to begin the process of reconstruction. A British Army officer, Major Ivan Hirst, was sent to inspect the Wolfsburg factory and found a pre-war prototype Volkswagen in it. He was impressed by the design, so together with a Colonel Radclyffe (both motoring enthusiasts) he lobbied for production to start in order to provide cars for the British army. By the end of 1946 the Beetle was well on its way to full production, and the foundations for Volkswagen’s successful automotive business were in place. One can’t help wondering whether the VW would exist at all today if Hirst hadn’t found the prototype. By 1947, the first few VW Beetles were arriving in the UK. A manufacturing plant was set up in Melbourne, Australia and the Karmann coachbuilding company began production of the Beetle Cabriolet at Osnabruck in 1949. Sales increased dramatically in the 1950s and in 1957 the 2 millionth Beetle rolled off the assembly line. 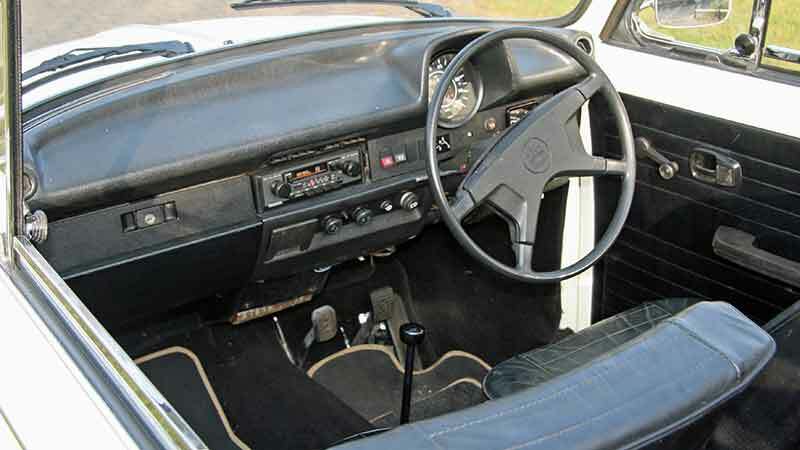 Success in British and European racing and rallying aided international sales. 5 million Beetles had been produced by 1961 and at the height of production Volkswagen were producing a car every 4 seconds. Walt Disney’s film ‘the Love Bug’ did no harm to sales in the USA. Ironically, due to its unique and quirky design, Hitler’s Volkswagen attracted 1960s peace lovers and developed a cult following. Associated with surf culture and the hippie movement, they were frequently custom painted with colourful, flowery designs. The Beetle was said to be able to float on water (for a short time at least!) thanks to its sealed floor pans and overall tight construction. Altogether over 21 million VW Beetles were manufactured. European production ceased in Germany in 1978, but the Karmann factory continued production of Cabriolet versions for a short period. The last of more than 330,000 cabriolets came off the conveyor belt in January 1980. However, plants in Mexico and Brazil continued where Germany left off, Mexican production continuing until 2003. An interesting fact about the VW Beetle is that it was marketed simply as the “Volkswagen”. There are various theories about how the Volkswagen became known as the Beetle, but considering the car’s shape, it’s not surprising they are names associated with animal cuteness. Other nicknames for the car are ‘the Bug’ in the USA, and ‘the Coccinelle’ or ladybug in France. The hugely selling VW Beetle starred in many films including the Disney film ‘the Love Bug’ in 1969 where it was named Herbie, a small, lovable outsider who beats superior automotive opponents. 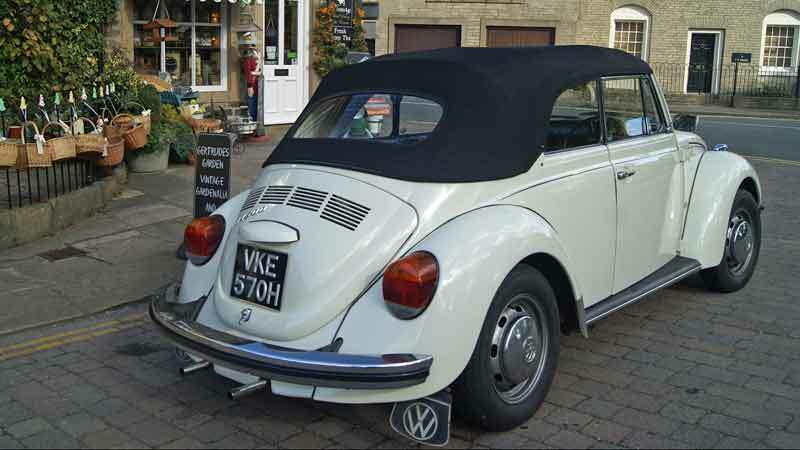 Hire a classic Beetle in Yorkshire and become a member of the Beetle appreciation society! 2 door, 4 seater soft top. Fairly limited boot space in the front but big enough for a medium suitcase and a bag.